The 2016 Miss Rodeo Nebraska Emily Taylor will wear Jo’s designs as she makes appearances at NebraskaLand Days events and the Buffalo Bill Rodeo. This year’s rodeo is June 15-18. Concerts by Sam Hunt on June 24 and Dierks Bentley on June 25 round out the NebraskaLandDays celebration. Tickets for the rodeo, concerts, and other activities can be purchased at the NebraskalandDays office, online at NebraskalandDays.com, and at the gate. For more information, visit the website or call the office at 308.532.7939. This time of year, Jo Morphew’s home in North Platte is strewn with fabric, thread and rhinestones. Lots of rhinestones. The North Platte woman works as a seamstress for rodeo queens and queen candidates, sewing much of the clothing worn by Miss Rodeo Nebraska and women vying for other titles. She got her start in the late 1990s when a neighbor up the road, Shanna Meyer Simpson, ran for Miss Rodeo Nebraska. Shanna’s mom asked her to sew, and she did it. She took a few years off, then in 2004, when another friend’s daughter ran and won the title of Miss Rodeo Nebraska, she began again. Each year, several girls who will compete for various rodeo queen titles, plus the reigning Miss Rodeo Nebraska, bring ideas, fabric and fringe to Jo. She works with them, designing the shirts, vests and dresses they wear to rodeos and appearances. Her biggest job is helping Miss Rodeo Nebraska with the wardrobe she will wear in Las Vegas each year as she competes for Miss Rodeo America. It involves a lot of material and crystals. Jo can’t estimate how many crystals she buys each year, but one order alone involved ten gross of each of five different colors. She keeps the crystals for the state queen separate, to make sure she has plenty for her outfits. Sewing taps into Jo’s creativeness. Her mother recognized that bent in her when she was nine, and got her involved in 4-H, where she learned to sew. She loves working with the queens and candidates on design. And she loves working with the girls, getting to know them well. Some of her more memorable outfits through the years have been a denim dress made for Michelle Boeshart, the 2010 Miss Rodeo Nebraska. The dress, which was embroidered with feather-like flowers, had over 11,000 crystals on it, all glued on, one by one. She also made an outfit for Samantha Chytka, the 2013 Miss Rodeo Nebraska, that was “Elvis-like:” a white jumpsuit made of gabardine, with gold faux leather trim and white tulle lace sleeves. When the supplies are delivered, Jo loves to look through them. Sewing helped her get through breast cancer, which she was diagnosed with in 2014. Even though she didn’t always feel well, she kept working. 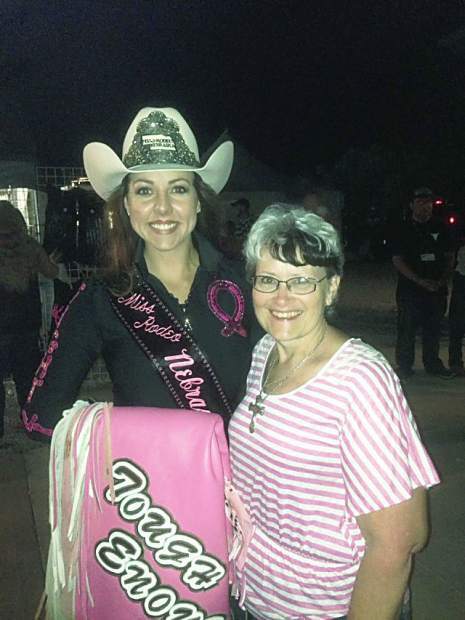 She was honored by the Callahan Cancer Center in 2015 as one of the cancer survivors at the Buffalo Bill Rodeo, and that year, she designed a black shirt with pink embellishments and pink butterflies, in honor of Tough Enough to Wear Pink night. It was worn by the 2015 Miss Rodeo Nebraska Joni Qualm.